Exciting offers for all Meracoupons.com visitors, we will be giving out a Rs.500 Flipkart e-Voucher every week to people who submit their email addresses. The blog will also be updated with the email address of the winner every week and a coupon code will be sent to the winner’s email address. Last couple of years we have seen an intense battle amongst these Online rivals to be the biggest shopping website in the country. What it has led to is is big saving opportunities for consumers, discounts ranging anywhere from 20% to 70% on the mark up prices. So just in-case you are not buying online, you are spending a lot more than the smart people who are now approx 40 million in numbers and are now buying stuff like groceries, diapers, mobiles, shoes, furniture and more online. The e-commerce industry is growing at a phenomenal rate of 33-35% annually and is attracting a lot of attention from Global communities, the latest news(rather rumour) of Alibaba upping it stake to 40% in Paytm is just a precursor to big things coming our way. Sample this, according to a tecnopak report from 2012 e-tailing in India is just 0.1% of total retail market which means a huge huge headroom, this report estimated the e-tail market to touch USD 76 billion by 2021 but i feel this number is underestimated, i would assume that the e-tail market will easily be up-word of 100 billion or atleast 15-20% of total retail. A large chunk of e-tail business in India will be driven by handheld/portable devices and the way Internet of Things(IOT) is shaping up it is not a distant future that even your refrigerator places order on your behalf for regular supplies. Wait, before you pick-up your phone to order a pizza from Dominos or Pizzahut or any of the popular pizza joints in your city. Whether you are Mumbai/Delhi/Bangalore or any other small city in the country you can save on your pizza order by placing an order Online. A host of websites including your very own Meracoupons.com offers a wide list of offers from Stores such as Dominos and Pizza hut Besides the coupons that you can get from couponing website like ours you can get great offers on food ordering sites like Foodpanda, Tinyowl and others. Infact, very recently Ola, the taxi aggregator started its food ordering service through their App the service is known as Ola cafe and is Available on their App. 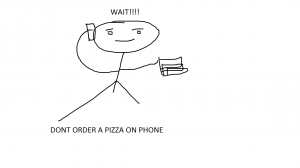 The best part about ordering a pizza from these special services is that you are sure to get an discount almost every time you want to order your favourite pizza. Motorola’s back, and is ready to kick off the global smartphone market with its low priced good spec loaded Moto G, and high spec loaded Moto X. Both the cellphones are available only via flipkart in the country, for moto G you can click here, and for moto X you can click here. Flipkart offers a price tag of Rs 12,499 for the 8GB version and Rs 13,999 for 16GB version whereas flipkart provides Moto X only in 16 GB version with a price quoted at Rs 23,999. Moto G is currently available only in black color whereas Moto X comes in 7 different variant namely : 1) walnut 2) black 3) white 4) royal blue 5) teak 6) turquoise 7) Red. Both the handsets comes up with a manufacturer warranty of 1 year. 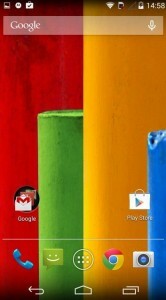 Moto G is designed to target low budget market of smartphones within a price range of 10,000-15,000 where generally a buyer get confused weather to go for a known brand with a little low spec handset or to go for a newly launched brand who is trying to get into the Indian market by offering high spec handsets at a reasonably low price, Moto G is designed for them. Moto G’s interface seriously makes it stand above its league just due to its offering of latest android interface KitKat (android 4.4.2). 1.2 GHz quad core processor is well equipped to handle the smoothest android interface till date, stock like interface makes it easier to interact in a happy way with the interface. The screen of the smartphone is really flair as it offers 720p display with a resolution of 720 X 1280 with a pixel density of 329ppi (please note iPhone 5s has a resolution of 640 X 1136 with 326ppi), yes moto G outweighs iPhone 5s here that too with a price tag of Rs 12,499. 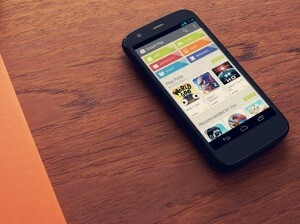 Watching Movies and playing games on Moto G will be a really amusing experience. The home screen is a pleasant experience, instead of off the screen “back” “home” and “multitasking” key Moto g offers on screen keys just like the nexus series and xperia Z and other high end smartphones. 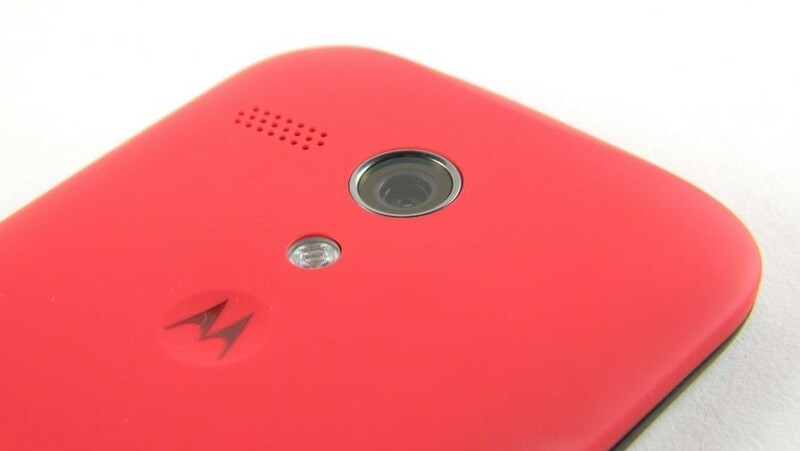 Moto G comes with a 5 MP Rear facing camera and 1.3MP front facing camera , both capable of shooting 720p videos, for low lighting conditions Moto G has a Flash as well. multiple shots and slow motion recording is another add on in the package. Camera equips an easy interface with instructions on first time usage as well, setting and gallery can be accessed with just a single slide over the screen. The back facing camera is a decent one, few times focusing issues occurs overall its decent, the front facing camera is pretty average (moreover you can’t demand much more in this price range). Laden with 2070 mAh battery Motorola claims Moto G has all day battery, but having used with a little higher than usual usage you can see red bar in top corner of your screen before you get yourself in the bed. 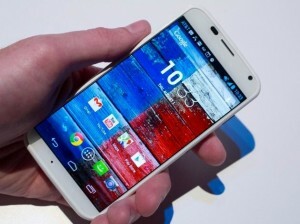 under the stewardship of Google, in august 2013 Motorola manufactured Moto X, Google was known to provide efforts in nexus series only but along with Motorola caused a serious stir in the market, earlier it was assumed that along with Motorola Google will develop a device with a mid-range specs and high price tag. What amazes in Moto X is its feel in the hand, having a AMOLED display of size 4.7inches the Moto X is just marginally bigger than the Apple’s iPhone 5S which is just 4 inches in terms of screen size. One hand operation is reasonably appraisable in Moto X, the feel comfort and easy operation using a single hand is even better than the iPhone. The back of the smartphone is of the shape of inside curve of palm and hence fits so perfectly in hands. The interface at first look resembles one you see in nexus series, the mobile network provider is shown in the left top corner of the screen in white taking up space of some notifications for sure. 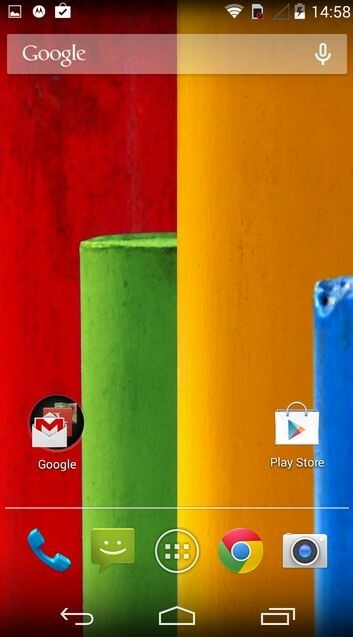 The app drawer is not as you see in nexus 5 with kit Kat; it is same old app drawer with a second tab for widgets available in the phone. The new features added to the device is trusted Bluetooth devices, Moto also implanted a lost my device feature on which Google was working for a long time. Motorola has seriously tried to go out of league with its camera , Moto X is equipped with 10MP Camera , with a 1.4 µm sized sensor which is relatively larger than the usual high end cameras now a days, larger pixels are meant to capture more light while clicking which makes camera stand out of league in terms of low lighting, with loaded high spec camera hardware , Moto X struggles to capture great clicks. This camera stands nowhere around flagships devices like xperia Z1 and iPhone 5s. 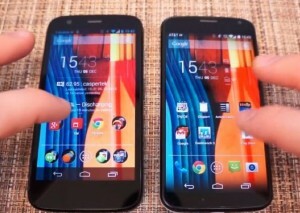 Although Moto has created a new way of accessing camera in a faster manner, even the screen of Moto X is turned off; a double flick of wrist will wake up the smartphone with its camera open, accessing gallery and settings is just a slide away from the camera screen and various camera features can easily be scrolled without clicking again and again on the screen. Motorola has fitted Moto x with 2200mAh battery, but with so many active features battery will surely get drained easily but the major drawback of the smartphone is the charging time, it gets charged really slow and runs towards the red battery level so fast. With a pretty decent usage of web browsing, music, checking inbox, Moto X lasts for a day but for the same usage many other smartphones in the same price range for a day and a half. Another dropdown in Moto X is its standby time, with nearly no usage on the smartphones the battery get drained in less than a day. Motorola should have opted a better way to utilize 2200mAh battery. Hold onto your seats ladies and gentlemen, the largest online shopping sale of India is back and how. Meracoupons is trying to list multiple GOSF 2013 deals, hope you keep up the shopping spirits and keep buying.. This is the first post in the series “look what we found” this week we will be talking about the best places online to purchase pen drives from at affordable prices. Pen drives have become an integral part of our digital lifestyle from carrying important files to favorite music from movies to games pen drives can carry huge amount of data in a small size. Pen drives are these days available from a starting storage capacity of 2Gb upto as high as 128 GB. There are a lot of pendrive brands available now in India with the most popular being Sandisk followed by Kingston, strontium and others. The prices are of a popular sandisk model, Cruzer Blade. The chart clearly indicates that Flipkart is a true leader when it comes to pricing on these products. Apart from regular pendrives there is a huge selection of custom shaped pendrives that are now easily available on top ecom sites. The brand that is gaining true mileage with such pendrives is “Microware” these pendrives do come with a premium but you can get cutest shapes in them, check some samples below. Stop Buying pendrives from retail. they are much cheaper when you pick them online and most of these sites keep coming out with offers which makes the prices lower by another 20-25% on offer days. The kind of range you get is unbelievable. You don’t need to worry about durability of these products as they hardly malfunction and even if they do you still save about half of your money when you buy them online. We are going to start a new series of posts around special deals or websites we found around the web. Needless to say these deals / websites will be related to Online shopping. While the big few websites in India have marketing muscle to gain prominent share of voice there is a descent number of small players who are in their own niches the best compared to anyone else. Sad that these guys can’t market much or reach out to their TG with a bang. We at meracoupons, have therefore taken this task upon ourselves to introduce you with these special selection of websites. We will talk about their USP’s, Good things about them, things they need to improve upon and how you as a buyer stand to gain from their expertises. The D7100 is companies latest APS-C DLSR with 24MP sensor. 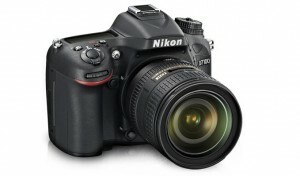 It is a successor to largely popular D7000. The camera offers DX-Format CMOS with a precise 51-point autofocus system. D7100 features a light weight body with high speed shooting which allows approximately 7 frames per second. 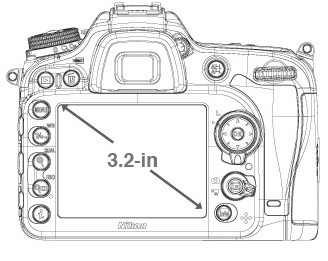 D7100 has a 3.2 inch TFT LCD monitor while the earlier model D7000 featured a 3″.